It’s Wednesday and you know what that means… Birthday Cake time! Well, it’s always cake time, right? 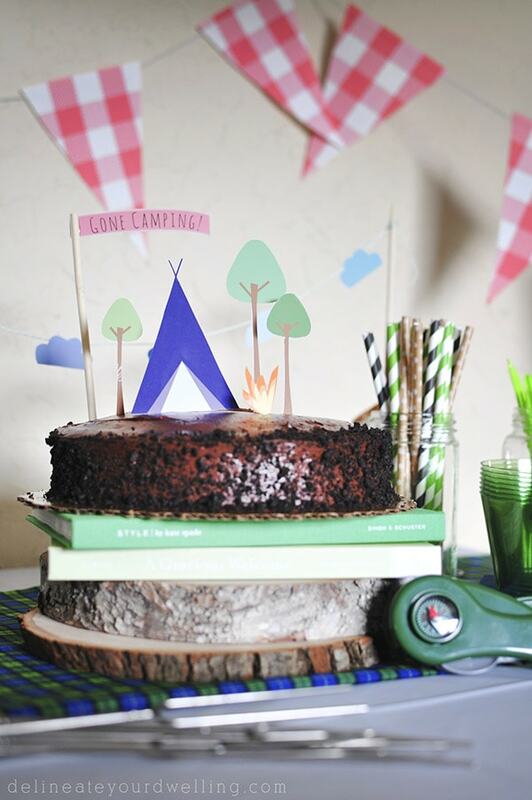 Today, is extra fun cake time because I’m sharing my Camping themed Birthday Cake I just made for my son’s third birthday. I love celebrating my babies on their birthdays and making them feel special. (And I know 3 and 4 yrs old is not a baby anymore, but this mama can’t quite let go yet!) Birthday parties, however, can quickly get out of control and you can spend hundreds of dollars on decor, favors, cake, activities, etc. I like going the DIY route because I can create a fun day for them but without spending much at all. 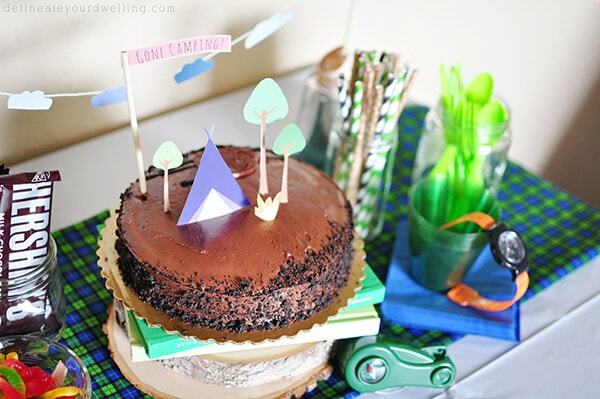 Each week, I’ve been sharing a few elements of the Camping birthday party. 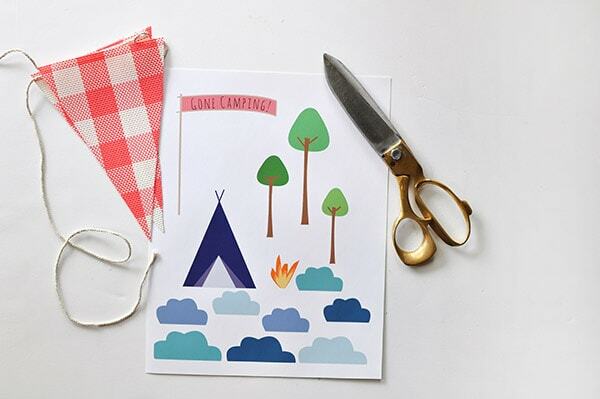 First, I shared the Camping Birthday Party invitation, which is a free printable. 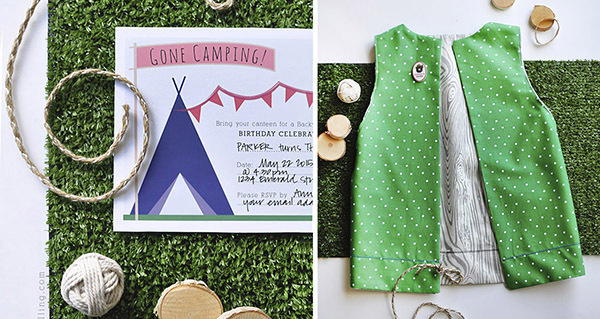 Last week, I shared How to sew a Dress-up Camping vest with my VERY limited sewing skills. I was so excited for this cake but am slowly learning my limitations. This was the first year I broke down and bought a cake. I know I could have easily made one, but they always take so much effort for me and never ever look like I want them to. I admit I am crafty, but I am not a fancy baker. So, for this party off to the grocery store I went for a delicious chocolate fudge cake. 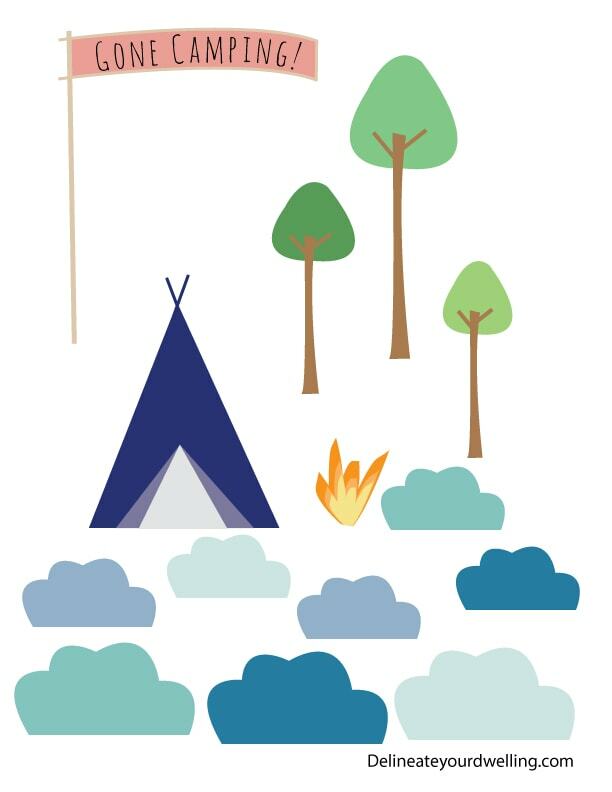 I then opened up Illustrator where I do most of my graphic designing and created these adorable paper camping items. And I’m going to offer them to you for FREE! Click to the bottom of the post for the link. I would recommend printing them on paper heavier than your typical printer paper. I printed mine on light card stock and they seemed to work out perfectly. After they are printed, get out your littlest scissors and cut them all out. 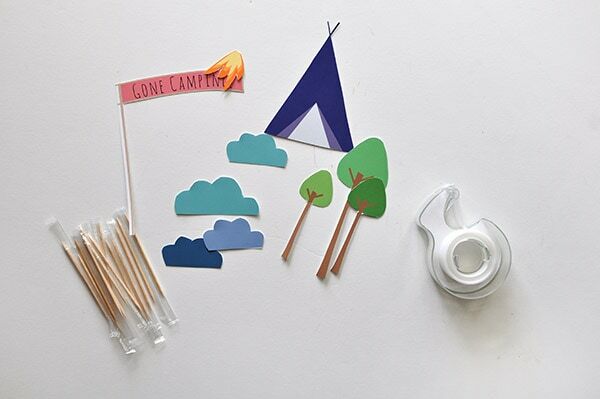 Secure each of your paper camping items to a toothpick with a small piece of paper. Be sure to all for a little bit of the toothpick to stick out so you can easily insert into the cake. 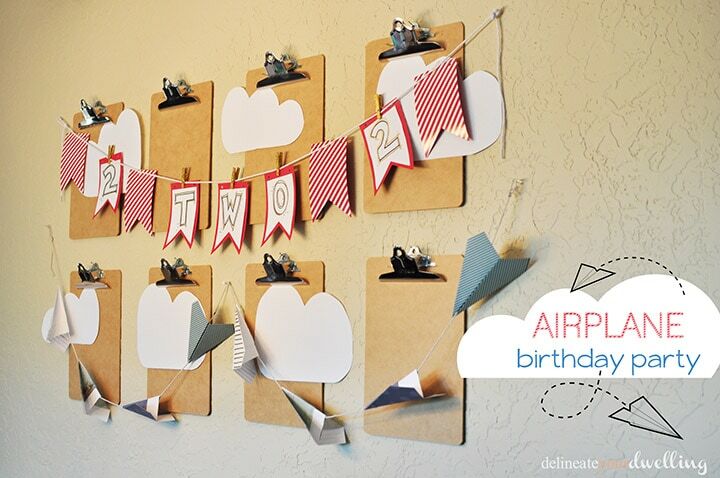 To create the cloud background, I hot glued the clouds to a small piece of twine. The twine was wrapped around two wooden skewers and secured to small wood slices (2-3” in diameter). I’m trying to think of another spot to use clouds on a string because they are so adorable! I was really pleased with the end result from this cake. 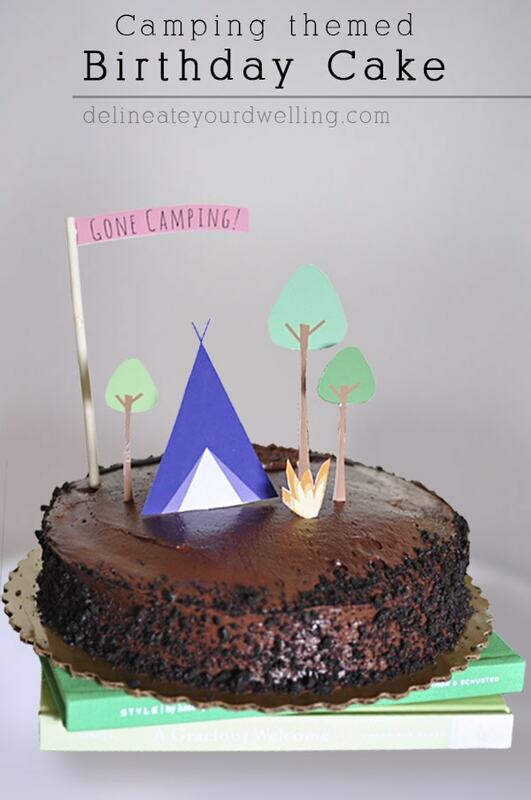 Be sure if you make any of these fun camping themed ideas tag me on Facebook or instagram, as I love featuring you all in my monthly newsletter! 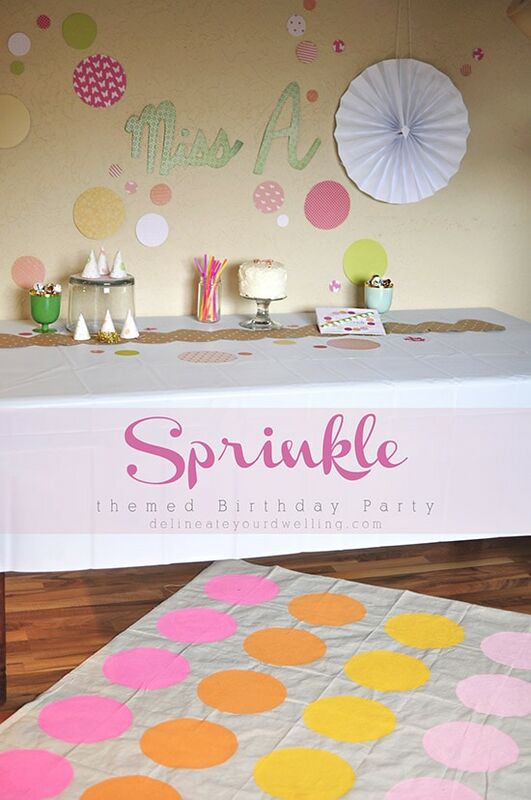 If you liked this birthday party idea, you might like some of the other parties I’ve done! Most. Adorable. Cake. Ever. !! So good! That little cloud banner though!! SO stinkin cute! Thanks girl… it might just have to find a spot in his room… along with my random other DIY’s I “give” them – ha! 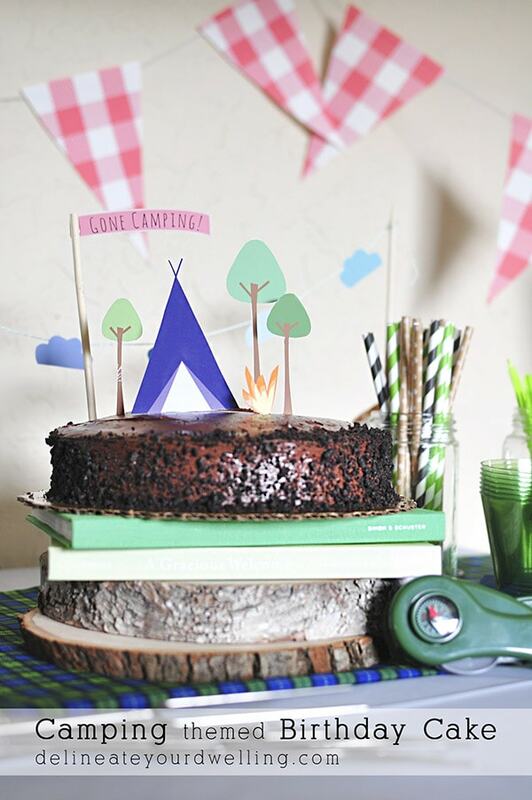 Your cake turned out so dang cute! Nice job. Grocery store cakes totally are my go-to from here on out! SO EASY. Aw, Reshma – you are TOO kind! I do love creating special birthdays for my kiddos. And we’ve since played “camping” about 100 times! Cute! Thanks for the printable too! That’s such a cute cake! 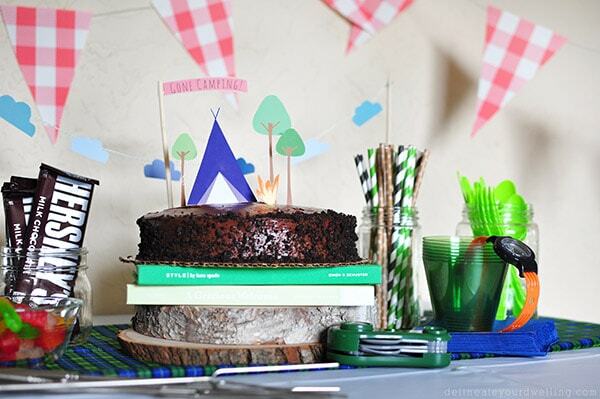 My hubby runs an outdoor adventure business so I might have to make this for his next birthday! My daughters cake was very very simple… Hoping her cake requests stay pretty simple (this year she wanted apple cake). I’m not much of a decorator! That’s why I loved this cake, I just cut out paper shapes! No decorating needed, ha.